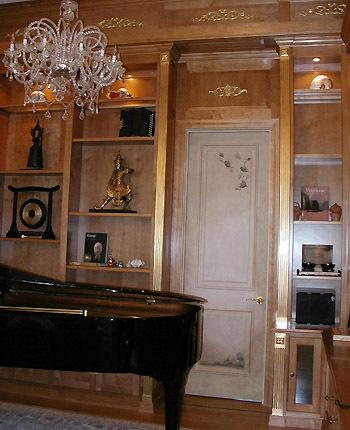 Appliques were gilded with combination gold leaf/schlagmetal in the studio, then applied to the music room walls. Gilded surfaces were treated first with gold-tinted shellac to prepare the surface for the leaf and add an extra layer of gold. Palo Alto, Ca. To see more of this project, click link below.